Last night we looked back at the various science flicks over the years that have been nominated for, but failed to win, the Academy Award for Best Picture. Hell, in 2009 science fiction accounted for two of the Best Picture nominees — James Cameron’s Avatar and Neill Blomkamp’s District 9. They both lost out to The Hurt Locker, but it was still a noteworthy milestone. 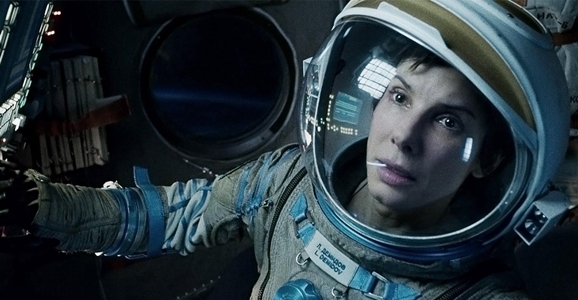 Last night it was a sci-fi two-fer once again, with both Gravity and Her up for the big award. Once again they both lost out for Best Picture, but let’s face it: Oscar got it right this time. There was little question that Alfonso Cuaron’s Gravity was going to clean up when it came to awards honoring technical achievements, and indeed it pretty much swept those. Gravity took home trophies for Cinematography, Film Editing, Original Score, Sound Editing, Sound Mixing, and Visual Effects. Cuaron himself also won the Best Director award. All of those were well deserved, because Gravity was unquestionably a stunning technical achievement. There were plenty of scientific nits to be picked, but on the big screen — especially if you saw it in IMAX and/or 3D — it was a dizzying, jaw-dropping thrill ride that was well worth the higher ticket price. What it was not, however, was a particularly great story. Sandra Bullock gave a fine performance in the lead role of Dr. Ryan Stone, but the character isn’t one people are still going to be talking about a decade from now. The bare-bones story exists primarily as one chaotic set piece after another, with the odd slower moment just to give audiences a breather. I can definitely get behind Cuaron’s Best Director win simply for being the evil genius who masterminded Gravity’s cinematic acrobatics, but there’s no way the film deserved Best Picture, especially when it was up against flicks like Captain Phillips and 12 Years a Slave, the latter of which did take home the Best Picture trophy. There were plenty of Oscar travesties over the years — 2001 not earning a Best Picture nomination, for one — but when it came to Gravity I think justice was served and it was honored in the categories where it was deserving of that praise. Here’s the full list of nominees and winners for your perusal.